Roofing materials and its styles affect the welfare and appearance of your home. Few building materials endure such constant abuse as roofing. Exposed to the harshest direct summer sun and to torrential downpours and hail, roofing materials are expected to perform flawlessly, season after season, year after year. That’s one good reason to choose the best roofing materials you can afford. Here’s some advise and tips from the building editors at Better Homes and Gardens® magazines. In addition to its practical function, roofing plays a major role in the design and overall appearance of your home. In color, texture, and composition, the roofing material should harmonize with the architectural style of the house it protects. On houses with steep roofs, the roofing material may be the most dominant architectural element, commanding attention even before the main body of the house comes into view and making the selection of new roofing critical. Typically, roofing lasts 15 to 50 years before it needs to be replaced, which means that the average homeowner is likely to encounter this task at least once or twice in a lifetime. Building a new home, changing a roofline, or building an addition also requires decisions on new roofing materials. 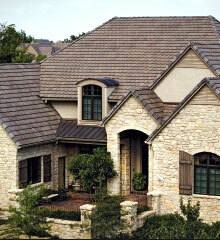 Fortunately, roofing manufacturers offer many styles, colors, and degrees of quality to suit any taste or budget. 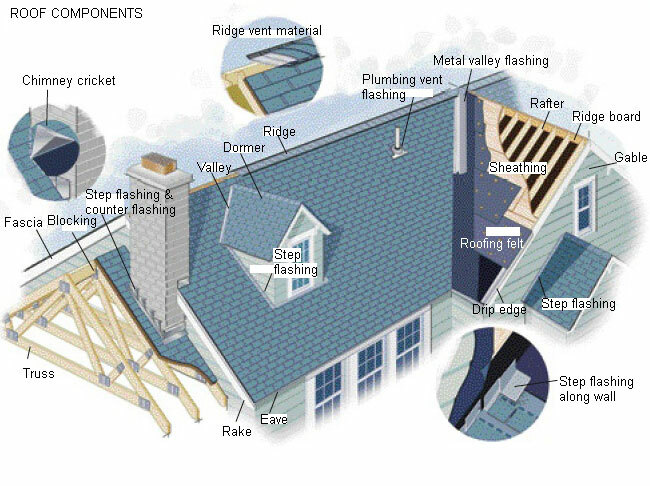 Many types of roofing are available, but all perform the same important function: protecting your house. Roofing can be basic, cost-effective, and simple, with subtle colors designed to blend in, not stand out. Or it can be a fanciful architectural statement, chosen for its ability to attract attention as well as fend off the elements. Traditional roofing materials include asphalt shingles – by far the most widely used type of roofing – wood shingles and shakes, metals (such as steel and copper), clay tiles, natural slate, and concrete tiles. The type of roofing you select depends on the architectural style of your house and on your budget and personal preferences. Some houses have large, prominent roofs; some have virtually no roofline at all. The roofline of your home will influence your selection of roofing materials. There are three basic roof forms: gable, hipped, and shed. More-specialized roof types, such as mansard, gambrel, and flat, are variations of the basic three. Each type displays a different amount of roofing material and exerts a major influence on the appearance of a house. Each roof has a certain pitch – the degree of slope in the roof. Pitch is expressed as an equation that describes how many inches the roof rises vertically for every 12 inches of horizontal measurement. A 6-in-12 roof pitch means the roof rises 6 inches for every 12 inches of horizontal span. A 12-in-12 roof rises 12 inches for every horizontal foot. If you draw a 12-in-12 roofline on paper, you’ll see the roof is at a 45-degree angle – a very steep roof indeed. Pitch affects the appearance of a home and helps determine the types of roofing materials that may be used. In general, the flatter the pitch, the more specialized the roofing materials must be. Most common roofing materials are not recommended for roofs with a pitch of less than 3-in-12, because water does not fall off quickly and the possibility exists that wind will force rain or melted snow up under the bottoms of the shingles. Nearly flat and completely horizontal rooftops (such as those on mansards) are best protected by a continuous, seamless membrane. Selecting the right color and texture requires judging the overall appearance of a house, both from an architectural standpoint and in relation to surrounding homes. Muted earth tones and shades of gray work well in traditional suburban settings where architectural styles are subdued and roofs blend into the overall fabric of the neighborhood. Although more heavily textured and more expensive than asphalt shingles, wood shakes will weather to a mellow gray and are a good choice for upgrading roofs in a traditional suburban setting. Bright colors and heavily textured roofs are generally reserved for custom architectural statements, and for historical homes where there is some precedent for the use of specialized materials, such as clay tiles. Metal roofing comes in many bold colors and is a favorite material for architects seeking to create striking exteriors. Sometimes regional influences play a role in the selection of roofing materials. 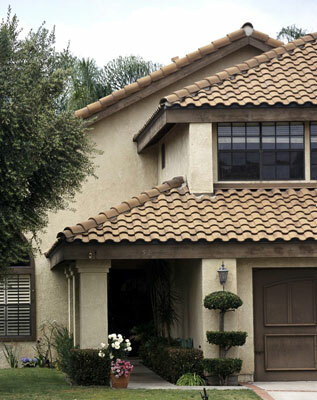 In the southwestern United States and Florida, clay tile roofs are common. In the Northeast, slate and lower-cost slate look-alikes are popular. When selecting roofing material, choose a color that harmonizes with the siding. Unless the roof plays an especially prominent role in the overall exterior design, let the siding be the dominant color. 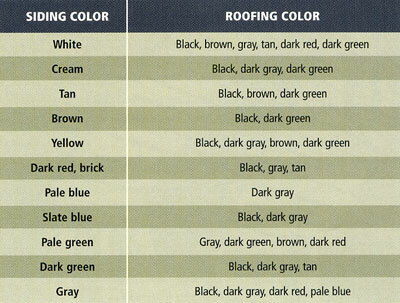 Choose a subordinate or complementary color for the roof. If you’re in doubt, gray is a safe choice that works well with many hues. Roofing can dramatically change the appearance of a home. If your existing roof is standard three-tab asphalt shingles, you can give the house a new look with architectural shingles or with concrete or metal tiles. Check local building codes and zoning ordinances. Many neighborhoods permit only certain types of roofing to ensure that one house is not jarringly different in style from other homes on the block. Local fire codes may prohibit wood shakes or wood shingles. Nonwood roofing materials typically are rated for fire resistance. Roofing that has a Class A rating will withstand even a fire that originates in the house below. Class B roofing will resist only moderate exposure to fire from outside the home, and Class C roofing has only minimal fire resistance. Check out the manufacturer’s warranty. It is usually a good idea to buy roofing that is guaranteed for at least 30 years. Although 20 years (the typical guarantee for low-end roofing products) may seem like a long time, moderate savings may not be worth it. Remember, when you sell the house, the remaining life expectancy of the roof may affect how much a buyer will pay. Well-built roof seals out water and directs it to gutters and downspouts, which carry the water away from the house. To perform well underlayment, flashings, and the roofing material must be installed correctly so water cannot seep under and damage the sheathing. A roof also must provide ventilation so the attic does not overheat in the summer. Inadequate ventilation can cause moisture buildup in the attic, which will likely compromise the insulation. It can also cause ice dams, which can damage the roofing, sheathing, and framing. Roof rafters and trusses rest on the top plates of the wall framing. If your roof has rafters they usually meet at a ridge board (or beam), a board that runs along the peak. A roof built with trusses usually has blocking pieces placed between trusses at the ridge. Trusses or rafter tails usually extend down past the house wall and are cut plumb at their ends. A fascia board is often attached to the rafter ends, and rain gutters are installed onto the fascia. The overhanging roof edge is called the eave; it is often covered on the underside with soffit boards that fit up against the house siding. Sheathing covers the rafters or trusses. In an older home sheathing may be made of 1� boards. In newer homes sheathing is usually made of plywood or OSB (oriented strand board). Roofing felt, often called tar paper, provides the underlayment for the roof. The felt is usually stapled down, but sometimes roofing nails or specialty nails are used. Felt is necessary to provide a vapor barrier that protects the sheathing from condensation moisture. At the lower parts of the roof near the eaves, a self-adhesive membrane is usually applied instead of felt to provide added protection against ice dams. Flashings are just as important as the roofing itself for sealing out rain and snow. They must be installed correctly so water cannot seep under them. Drip-edge flashing is designed for use at eaves and rakes (the ends of the roof). Usually the eave flashing is installed, then the underlayment, then the rake flashing. At a valley wide flashing is installed over two layers of underlayment and under the roofing. Plumbing vents have their own rubber flashing, which fits under the shingles at the top half and over the shingles at the bottom half. At the chimney there is a complicated arrangement of step flashing pieces, a cricket, and counterflashings, which must be correctly installed and sealed with roofing cement to keep water out of the structure. Finally the roofing itself covers the underlayment and most of the flashings. Whichever type of roofing you apply, it must be installed so every piece overlaps the next lower piece, allowing water to flow down. Roofing nails or staples are almost all covered by another piece of roofing above. Where they are exposed they should be protected with roofing cement. Hopefully these are helpful tips to help you plan your next roofing project!